Plane symmetry is analogous to line symmetry, except that it is in three dimensions. The three dimensional figure is divided into two halves by a plane. 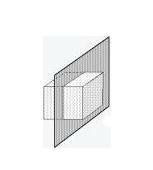 The following diagram shows a plane symmetry of a cuboid.